While an evening cup of coffee gives you a shot of energy to be more alert and awake, it also comes with un-fun side effects, according to a new study. 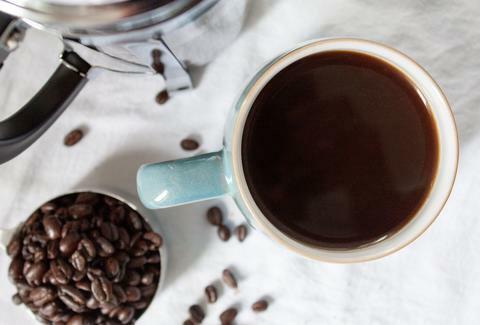 New, preliminary research suggests your late night caffeine fix could be messing with your body's internal sense of time and even make you feel crappy and sluggish during the day -- kind of like jet-lag, according to a report by NPR. Basically, consuming caffeine in the hours before you hit the sack delays your body's circadian clock, or the thing that "keeps your body running in time with the world," and that's a big deal because such irregularities have previously been associated with a host of health issues. Co-authored by Kenneth Wright Jr., a professor with the Department of Integrative Physiology at the University of Colorado at Boulder, the research focused on five volunteers placed in "highly controlled conditions" for 49 days. Within three hours of bedtime, the people were given either a caffeine dose equivalent to a double espresso, a placebo, or were exposed to bright or dim light, then the researchers tested their saliva for melatonin, a sleep hormone. According to the study's summary, the dose of caffeine delayed the subjects' internal clock by 40 minutes, or about half as long as the impact of exposure to bright light. "We found that caffeine did indeed, in the evening, shift your clock later," Wright said in the NPR report. "What we're seeing here now is another way that caffeine impacts our physiology that we didn't know about before in humans." This, in turn, could make it even harder for you to get out of bed at the right time, another expert said. It's probably time to rethink that nighttime cup of joe, you guys. Or at least try switching to decaf. Tony Merevick is Cities News Editor at Thrillist and strongly believes nighttime coffee is worth it, because mmm. Send news tips to news@thrillist.com and follow him on Twitter @tonymerevick.